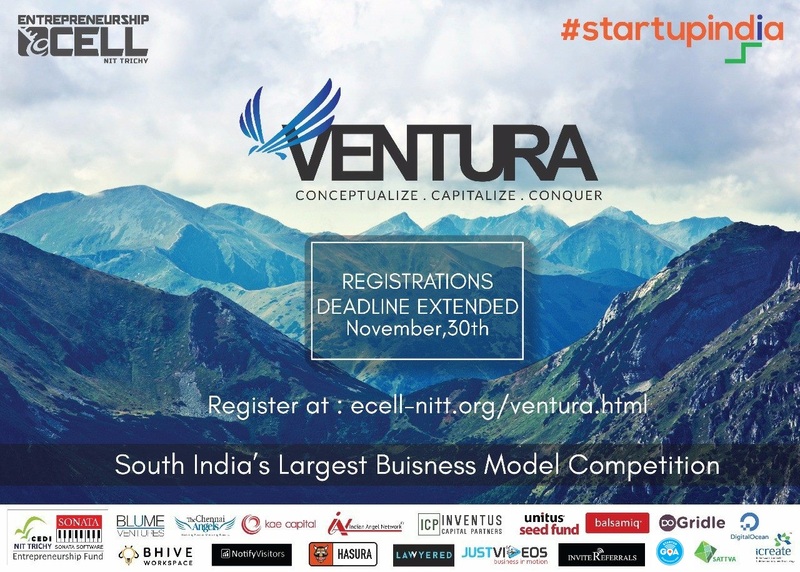 NIT Trichy organizes and brings forward Venture’18 – an international business model competition taking place in the beginning of 2018. Ventura will provide upcoming entrepreneurs the ideal platform to interact with others, learn and collaborate, and build a better network to take things forward. The event will feature mentorship programs, sessions by leading entrepreneurs, webinars and so much more. Ventura will provide their audience with the perfect platform to realize and better understand their vision. That’s not all, the prizes and the awards being given out this year should be around, 2 lacs and the event will have additional resources amounting to USD 1 mil. Currently, the event has managed to create and spread awareness in more than 225 colleges across the country. Students from 22 states will be in attendance. The 10th edition of the event puts attendees in touch with VCs and angel investors. Students get the chance to present Startup ideas or general ideas that they have, and get a chance to be part of a one to one mentoring program with experienced entrepreneurs. More information is always available on their website. Make haste and register. Registrations close on the 30th of November.